If you’ve got a deck, it will have weathered a harsh winter outdoors and may be in need of a little clever and effective TLC. Every year homeowners get excited for spring cleaning, but all that home love shouldn’t stop at your front door. If you’ve got a deck, it will have weathered a harsh winter outdoors and may be in need of a little clever and effective TLC. Here are some spring maintenance tips to help get your deck ready for a summer of fun. Before you make any decisions about your deck and get started on that all important spring maintenance, you need to know exactly how it’s doing. Your very first task should be a thorough general inspection of your deck. Look at its features, probe it for rot, and take not of any wood that has warped or come loose. Check any wet areas for warping, rot, and mold. Also look for cracking a cupping. See if you need small DIY repairs, or major replacements. If you notice anything major, you may want to consult a professional. Cleaning goes far deeper than appearance. While a clean deck looks better and is more inviting, a regularly cleaned deck will last far longer than a neglected one. With all of the time, money, and energy you have invested in your deck, making sure you get the most out of that investment with regular cleanings only makes sense. 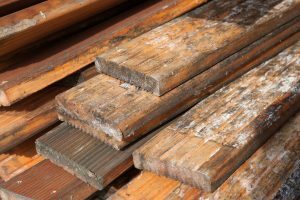 When grime and mold accumulate on a deck over time, they can massively speed up deterioration. Sweep regularly and do occasional thorough cleanings with a cleaning solution of your choice. After your deck is clean, it is time to decide whether to seal it or not. Not everyone takes this step, but it is still quite a popular option. Whether you opt for a seal or a stain, each has a different timeline it must be applied on. Clear sealers often require annual reapplication, which stains need to be reapplied every other year. Never seal or stain a wet deck. Always wait 48 hours after washing before applying anything else. Mid-Atlantic Deck & Fence has almost 30 years of experience in building beautiful custom fences, gazebos, screened-in porches, and decks throughout the state of Maryland. We have the expertise to design your dream fence or custom deck and have it installed in a headache-free process. Give us a call at 1-800-833-9310 or visit us online for a quote today! We offer many different styles of fencing and decking in addition to custom options designed specifically to suit your preferences and tastes. To see examples of our work and get more tips on how to choose the right gazebo for your family, follow us onFacebook, Twitter, Houzz, Pinterest, Google+, YouTube, and LinkedIn.